(Nanowerk News) The world's biggest Roman candle has got nothing on this. Using super-high pressures similar to those found deep in the Earth or on a giant planet, Washington State University researchers have created a compact, never-before-seen material capable of storing vast amounts of energy. "If you think about it, it is the most condensed form of energy storage outside of nuclear energy," says Choong-Shik Yoo, a WSU chemistry professor and lead author of results published in the journal Nature Chemistry. 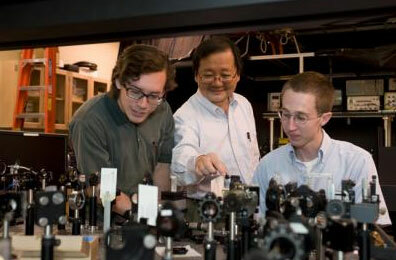 Washington State University chemist Choong-Shik Yoo, seen here with students, has used super-high pressures to create a compact, never-before-seen material capable of storing vast amounts of energy. The research is basic science, but Yoo says it shows it is possible to store mechanical energy into the chemical energy of a material with such strong chemical bonds. Possible future applications include creating a new class of energetic materials or fuels, an energy storage device, super-oxidizing materials for destroying chemical and biological agents, and high-temperature superconductors. The researchers created the material on the Pullman campus in a diamond anvil cell, a small, two-inch by three-inch-diameter device capable of producing extremely high pressures in a small space. The cell contained xenon difluoride (XeF2), a white crystal used to etch silicon conductors, squeezed between two small diamond anvils. At normal atmospheric pressure, the material's molecules stay relatively far apart from each other. But as researchers increased the pressure inside the chamber, the material became a two-dimensional graphite-like semiconductor. The researchers eventually increased the pressure to more than a million atmospheres, comparable to what would be found halfway to the center of the earth. All this "squeezing," as Yoo calls it, forced the molecules to make tightly bound three-dimensional metallic "network structures." In the process, the huge amount of mechanical energy of compression was stored as chemical energy in the molecules' bonds.